Holds a complete rack of stoppered test tubes for rotating end-over end. Does double duty as a holder for bottles, Erlenmeyer flasks, or other stoppered containers. Retaining plate is polyfoam-lined, making it easy on glassware, and is held by two knurled nuts. Head will hold rack 12" x 5", with tubes 75-200 mm long. Quick adjustment permits load to be balanced on motor-drive axis. Excellent for rotating an assortment of glassware up to 2-1/4" in diameter. Equipped with six large 3-finger clamps that hold securely without scratching. Head easily attaches directly onto any Rugged Rotator. Hexagonal casting mounts quickly on rotator. Clamps attach to casting individually with lockable thumb screws. Clamp position is adjustable to permit axial or end-over-end rotation of container. This aluminum disk is equipped with spring clips to hold test tubes for such operations as blood agitations, isotopic competitive protein binding assays, and similar procedures. The spring clips permit the tubes to be inserted radially from the side of the clip rather than the clip. The clips are adjustable. Size: 14", aluminum disk. Furnished with 31 spring clips to accommodate 10 mm- to18 mm-diameter tubes and 16 spring clips to accommodate 20 mm- to 30 mm diameter tubes. 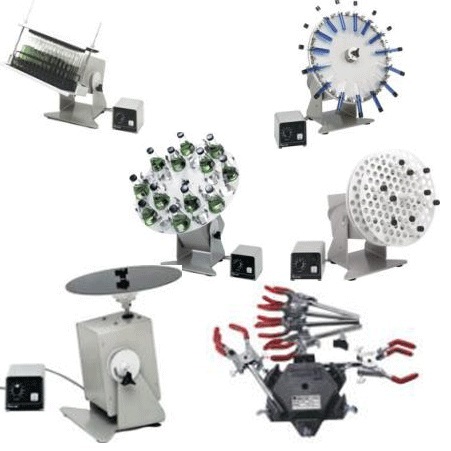 Designed to hold as many as 108 mini tissue-culture tubes, each up to 16 mm in diameter, this head facilitates simultaneous rotating. Quickly attaches to any Rugged Rotator and, when mounted, is still compact enough to fit into a table-top incubator. Size: 13"w x 14"d x 13"h. Consists of a drum, 12"in diameter with 108 spaces for tubes. Angle can be adjusted so that tube content won't touch cap while rotating. Frequently used for embedding tissue for electron microscopy, the no-slip design of spaced disks with springs conveniently holds. a combination of test, bottles, syringes, etc. Tubes are easily inserted or removed by deflecting leaf spring between disks. Clamps will not scratch glassware. Accepts 22 pieces of glassware each up to 25mm in diameter or 44 pieces up to 16mm. Head may be adjusted so that tube contents won't touch cap. Adjustable disk orientation provides gentle mixing or more active motion. 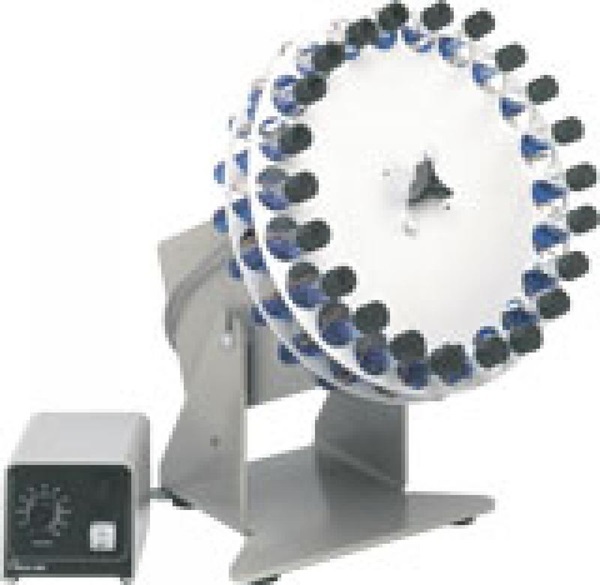 Conveniently rotates a large number of Erlenmeyer flasks at once. Attaches with ease to any Rugged Rotator base. Simple, long-wearing design consists of aluminum disk, 18" in diameter, with 52 holes to accept stainless-steel flask clamps (order separately). Clamp sizes may be intermixed on disk. 22 up to 25mm dia. Test tube head with clamps, come with two sizes 14"
Tissue culture tube head 12"